Definition at line 27 of file CMCAMethod.h. Definition at line 42 of file CMCAMethod.cpp. Definition at line 59 of file CMCAMethod.cpp. Definition at line 132 of file CMCAMethod.cpp. Definition at line 673 of file CMCAMethod.cpp. References calculateUnscaledConcentrationCC(), calculateUnscaledElasticities(), calculateUnscaledFluxCC(), checkSummationTheorems(), createLinkMatrix(), CSteadyStateMethod::found, MCMCA, mpModel, mpUseReeder, mpUseSmallbone, mSSStatus, mUnscaledConcCC, mUnscaledFluxCC, scaleMCA(), and CCopasiMessage::WARNING. Definition at line 311 of file CMCAMethod.cpp. References CVectorCore< CType >::array(), CMatrix< CType >::array(), C_FLOAT64, C_INT, dgemm_(), dgetrf_(), dgetri_(), CLinkMatrix::doColumnPivot(), K, CLinkMatrix::leftMultiply(), mLinkZero, mpModel, mReducedStoichiometry, mUnscaledConcCC, mUnscaledElasticities, CMatrix< CType >::numCols(), CMatrix< CType >::numRows(), CMatrix< CType >::resize(), CVector< CType >::resize(), CLinkMatrix::rightMultiply(), CLinkMatrix::undoColumnPivot(), and CLinkMatrix::undoRowPivot(). 363 C_INT lwork = -1; // Instruct dgetri_ to determine work array size. 397 // We need to swap the rows since they are with respect to reordered stoichiometry . Definition at line 203 of file CMCAMethod.cpp. References CVectorCore< CType >::array(), CMatrix< CType >::array(), CCopasiVector< T >::begin(), C_FLOAT64, CCopasiVector< T >::end(), CModel::getMetabolitesX(), CModel::getNumDependentReactionMetabs(), CModel::getNumIndependentReactionMetabs(), CModel::getParticleFlux(), CModel::getReactions(), mElasticityDependencies, mFactor, min, mpModel, mUnscaledElasticities, CMatrix< CType >::size(), CCopasiVector< T >::size(), and CModel::updateSimulatedValues(). 207 // We need the number of metabolites determined by reactions. 283 mpModel->updateSimulatedValues(false); // TODO test if true or false should be used. 290 mpModel->updateSimulatedValues(false); // TODO test if true or false should be used. Definition at line 403 of file CMCAMethod.cpp. References CMatrix< CType >::array(), C_FLOAT64, C_INT, dgemm_(), dlaset_(), K, mpModel, mUnscaledConcCC, mUnscaledElasticities, mUnscaledFluxCC, CMatrix< CType >::numCols(), and CMatrix< CType >::numRows(). Check whether the summation theorems hold. Definition at line 598 of file CMCAMethod.cpp. References CVectorCore< CType >::array(), CMatrix< CType >::array(), C_FLOAT64, max, min, mScaledConcCC, mScaledFluxCC, CMatrix< CType >::numCols(), CMatrix< CType >::numRows(), CVector< CType >::resize(), and CMatrix< CType >::size(). Definition at line 718 of file CMCAMethod.cpp. References CLinkMatrix::build(), CLinkMatrix::doRowPivot(), CSteadyStateTask::getJacobian(), CModel::getL0(), CLinkMatrix::getNumIndependent(), CModel::getNumIndependentReactionMetabs(), CModel::getRedStoi(), CModel::getStoi(), mLinkZero, mpModel, mpSteadyStateTask, mReducedStoichiometry, CMatrix< CType >::numCols(), and CMatrix< CType >::resize(). Definition at line 34 of file CMCAMethod.cpp. Definition at line 154 of file CMCAMethod.cpp. Definition at line 797 of file CMCAMethod.cpp. Definition at line 80 of file CMCAMethod.h. Definition at line 92 of file CMCAMethod.h. Referenced by CMCAResultSubwidget::loadConcentrationCCs(), and CMCATask::printResult(). Definition at line 77 of file CMCAMethod.h. Definition at line 88 of file CMCAMethod.h. Referenced by CMCAResultSubwidget::loadElasticities(), and CMCATask::printResult(). Definition at line 83 of file CMCAMethod.h. Definition at line 96 of file CMCAMethod.h. Referenced by CMCAResultSubwidget::loadFluxCCs(), and CMCATask::printResult(). Definition at line 147 of file CMCAMethod.h. Referenced by CMCAResultSubwidget::loadAll(), and CMCATask::printResult(). Definition at line 67 of file CMCAMethod.h. Definition at line 90 of file CMCAMethod.h. Definition at line 62 of file CMCAMethod.h. Definition at line 86 of file CMCAMethod.h. Definition at line 72 of file CMCAMethod.h. Definition at line 94 of file CMCAMethod.h. Definition at line 138 of file CMCAMethod.cpp. References CCopasiParameterGroup::assertParameter(), CCopasiParameter::BOOL, CCopasiParameterGroup::getParameter(), CCopasiParameter::getValue(), mpUseReeder, mpUseSmallbone, CCopasiParameter::Value::pBOOL, CCopasiParameter::Value::pUDOUBLE, CCopasiParameterGroup::removeParameter(), CCopasiParameterGroup::setValue(), and CCopasiParameter::UDOUBLE. Referenced by CMCAMethod(), and elevateChildren(). Definition at line 77 of file CMCAMethod.cpp. References mScaledConcCC, mScaledConcCCAnn, mScaledElasticities, mScaledElasticitiesAnn, mScaledFluxCC, mScaledFluxCCAnn, mUnscaledConcCC, mUnscaledConcCCAnn, mUnscaledElasticities, mUnscaledElasticitiesAnn, mUnscaledFluxCC, mUnscaledFluxCCAnn, CArrayAnnotation::setDescription(), CArrayAnnotation::setDimensionDescription(), CArrayAnnotation::setMode(), and CArrayAnnotation::VECTOR. Definition at line 803 of file CMCAMethod.cpp. References CModelEntity::ASSIGNMENT, CCopasiVector< T >::begin(), CStateTemplate::beginIndependent(), CCopasiVector< T >::end(), CStateTemplate::endIndependent(), CCopasiMessage::ERROR, CModel::getCompartments(), CCopasiProblem::getModel(), CModel::getNumIndependentReactionMetabs(), CModel::getStateTemplate(), CCopasiMethod::isValidProblem(), mpUseReeder, and mpUseSmallbone. 821 // Check if the model contains an ODE. Definition at line 745 of file CMCAMethod.cpp. References C_INT32, CReadConfig::getVariable(), CReadConfig::LOOP, and mSSReder. Definition at line 757 of file CMCAMethod.cpp. Resizes all result matrices and updates the corresponding array annotations. This needs to be called before output initialization (in case the output references parts of the matrix) from the task initialization, but it also needs to be called before selecting elements of the matrices in the object selection dialog. The model needs to be set before calling this. Definition at line 160 of file CMCAMethod.cpp. 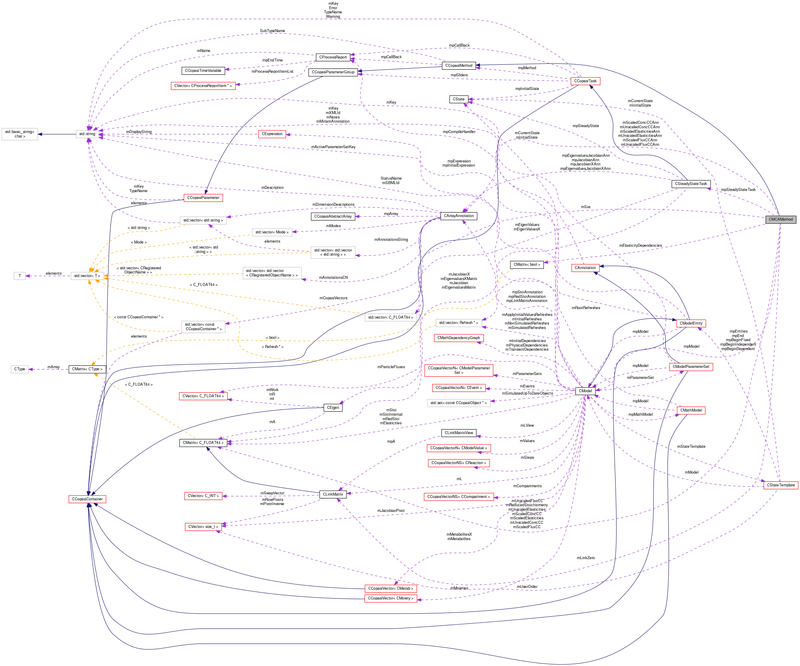 References CModel::getMetabolitesX(), CModel::getNumDependentReactionMetabs(), CModel::getNumIndependentReactionMetabs(), CModel::getReactions(), CModel::getTotSteps(), mElasticityDependencies, mpModel, mScaledConcCC, mScaledConcCCAnn, mScaledElasticities, mScaledElasticitiesAnn, mScaledFluxCC, mScaledFluxCCAnn, mUnscaledConcCC, mUnscaledConcCCAnn, mUnscaledElasticities, mUnscaledElasticitiesAnn, mUnscaledFluxCC, mUnscaledFluxCCAnn, CMatrix< CType >::numCols(), CMatrix< CType >::numRows(), CMatrix< CType >::resize(), CArrayAnnotation::resize(), and CArrayAnnotation::setCopasiVector(). Definition at line 440 of file CMCAMethod.cpp. References CMatrix< CType >::array(), CCopasiVector< T >::begin(), C_FLOAT64, CCopasiVector< T >::end(), CSteadyStateMethod::found, CModel::getMetabolitesX(), CModel::getNumDependentReactionMetabs(), CModel::getNumIndependentReactionMetabs(), CModel::getReactions(), CModelEntity::getValue(), mElasticityDependencies, mpModel, mScaledConcCC, mScaledElasticities, mScaledFluxCC, mSSStatus, mUnscaledConcCC, mUnscaledElasticities, mUnscaledFluxCC, and CMatrix< CType >::numCols(). 443 // The number of metabs determined by reaction. 559 // In the diagonal the scaling factors cancel. 575 C_FLOAT64 ScaleCol = (pCompartmentCol == NULL) ? 585 *pScaled = (((*itReaction)->getFlux() < 0.0) ? Definition at line 787 of file CMCAMethod.cpp. Definition at line 663 of file CMCAMethod.cpp. Referenced by CMCATask::printResult(), and CMCATask::updateMatrices(). Definition at line 792 of file CMCAMethod.cpp. Definition at line 773 of file CMCAMethod.cpp. References CSteadyStateTask::getResult(), mpSteadyStateTask, mSSStatus, and CSteadyStateMethod::notFound. Definition at line 225 of file CMCAMethod.h. Referenced by calculateUnscaledElasticities(), resizeAllMatrices(), and scaleMCA(). Definition at line 213 of file CMCAMethod.h. Referenced by calculateUnscaledElasticities(), and setFactor(). Definition at line 221 of file CMCAMethod.h. Referenced by calculateUnscaledConcentrationCC(), and createLinkMatrix(). Definition at line 172 of file CMCAMethod.h. Referenced by CalculateMCA(), calculateUnscaledConcentrationCC(), calculateUnscaledElasticities(), calculateUnscaledFluxCC(), createLinkMatrix(), getModel(), resizeAllMatrices(), scaleMCA(), and setModel(). Definition at line 219 of file CMCAMethod.h. Referenced by createLinkMatrix(), and setSteadyStateTask(). Definition at line 174 of file CMCAMethod.h. Referenced by CalculateMCA(), initializeParameter(), and isValidProblem(). Definition at line 176 of file CMCAMethod.h. Definition at line 223 of file CMCAMethod.h. Definition at line 193 of file CMCAMethod.h. Referenced by checkSummationTheorems(), getScaledConcentrationCC(), initObjects(), resizeAllMatrices(), and scaleMCA(). Definition at line 194 of file CMCAMethod.h. Referenced by getScaledConcentrationCCAnn(), initObjects(), and resizeAllMatrices(). Definition at line 190 of file CMCAMethod.h. Referenced by getScaledElasticities(), initObjects(), resizeAllMatrices(), and scaleMCA(). Definition at line 191 of file CMCAMethod.h. Referenced by getScaledElasticitiesAnn(), initObjects(), and resizeAllMatrices(). Definition at line 196 of file CMCAMethod.h. Referenced by checkSummationTheorems(), getScaledFluxCC(), initObjects(), resizeAllMatrices(), and scaleMCA(). Definition at line 197 of file CMCAMethod.h. Referenced by getScaledFluxCCAnn(), initObjects(), and resizeAllMatrices(). Definition at line 202 of file CMCAMethod.h. Definition at line 217 of file CMCAMethod.h. Referenced by CalculateMCA(), getSteadyStateStatus(), scaleMCA(), and setSteadyStateTask(). Definition at line 208 of file CMCAMethod.h. Definition at line 215 of file CMCAMethod.h. Referenced by process(), and setSteadyStateResolution(). Definition at line 184 of file CMCAMethod.h. Referenced by CalculateMCA(), calculateUnscaledConcentrationCC(), calculateUnscaledFluxCC(), getUnscaledConcentrationCC(), initObjects(), resizeAllMatrices(), and scaleMCA(). Definition at line 185 of file CMCAMethod.h. Referenced by getUnscaledConcentrationCCAnn(), initObjects(), and resizeAllMatrices(). Definition at line 181 of file CMCAMethod.h. Referenced by calculateUnscaledConcentrationCC(), calculateUnscaledElasticities(), calculateUnscaledFluxCC(), getUnscaledElasticities(), initObjects(), resizeAllMatrices(), and scaleMCA(). Definition at line 182 of file CMCAMethod.h. Referenced by getUnscaledElasticitiesAnn(), initObjects(), and resizeAllMatrices(). Definition at line 187 of file CMCAMethod.h. Referenced by CalculateMCA(), calculateUnscaledFluxCC(), getUnscaledFluxCC(), initObjects(), resizeAllMatrices(), and scaleMCA(). Definition at line 188 of file CMCAMethod.h. Referenced by getUnscaledFluxCCAnn(), initObjects(), and resizeAllMatrices().